This family hunt is 9 year-old Patrick Lefemine Jr.'s first big game bowhunt and he will be hunting for wild hogs along with his mom Julie and his father Pat Sr. This special family hunt also includes Matthew Lefemine (aka. "World's Greatest Tracker") as an observer, bloodtrailer and Patrick's dragging buddy. Because this is a short hunt (3 days) we are splitting up a morning and afternoon hunt on separate days. This being our first "family bowhunt", we needed to pick a special place. The criteria was simple: we needed lots of opportunities at game, we needed close shots, and we needed a family-friendly atmosphere. In addition, because of his young age (9 years old) and the fact that we could only do this hunt during my boys' summer vacation, it would have to be a hunting ranch. 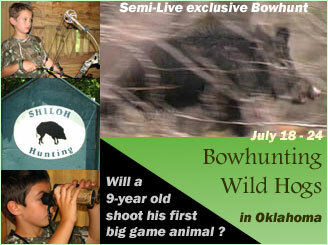 The choice was clear to me, we chose longtime Bowsite.com sponsor - Shiloh Ranch. I had come to know Matt and Cheryl Napper's Oklahoma hog hunting operation well over the last several years. During that time I had read dozens of accolades and seen lots of photos from satisfied hunters. In addition, I knew that Shiloh provided individual attention to small groups. That was important to me. But above all, I knew Matt and Cheryl to be great people who would welcome my family and provide us with a fabulous hunt. It really was a "no-brainer." We had decided last night to skip the early morning hunt and go over some things with Matt and Cheryl. The first being shot-placement on hogs which Cheryl described to Patrick Jr, Julie and myself. I had shot 5 hogs prior to this hunt and thought I knew a thing or two about hog anatomy, but I deferred to Cheryl and Matt and it was a good thing, they taught all of us a thing or two about placement and vital position on hogs. With that knowledge fresh in their mind, Pat and Matt headed to the practice range to loosen up before their first hunt. They told us about several options for hunt locations. They had two large wooden blinds that could accommodate two adults and two children - along with video gear. Julie and I wanted to be there on Patrick's hunt so we opted to hunt one of those locations. Matt mentioned that the wind was going to be "tricky" since they were really set up for a South wind and the recent hurricanes had it reversed. The hunt was going to be a short one, only about 90 minutes - so we gave it a shot anyway. 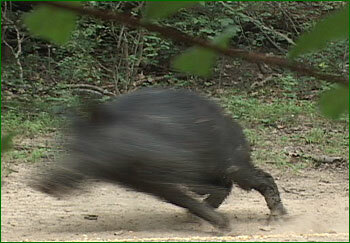 Thirty minutes into the hunt a lone hog showed up but slammed on the brakes and began to growl something fierce. He growled all the way through the woods as he sped away. I had never seen hogs react this way and discussed this with Matt when he showed up an hour later. Matt explained how his hogs were truly "wild" hogs. They know when things are out of place, and they use their noses like a whitetail. 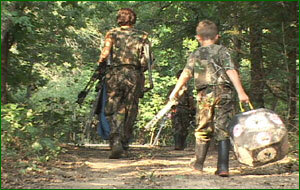 This was so much different than the other hog hunts I had been on. This was going to be fun!